How Much Does Alarm System Installation Cost? Did you know that over 2,200,000 burglaries occur in the US every year and that 70.3% of burglary offenses occur in residential properties? Well, given these statistics from the FBI, it only makes sense that you take a proactive approach to your home security. 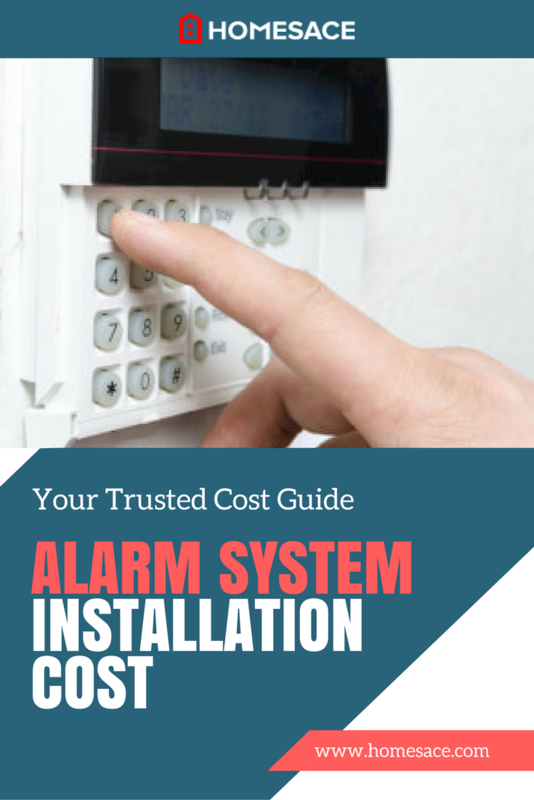 But, before you go ahead and place an order for your new alarm system installation, it is important that you know the cost. For our discussion, we are going to focus on the cost to install an alarm system through a professional service and not the DIY option. This is because a DIY installation, in most cases, does not come with a 24-hour monitoring feature, which is the main reason you are considering a new alarm system. Dimensions of your house: The dimensions of your house naturally affect the cost of buying and installing a security alarm. A large home normally needs more sensors, detectors and possibly keypads. It also increases the time it takes to install wiring (unless you choose a wireless system). Sensors (heat, motion, sound, and smoke): These can all be linked to your alarm system installation, and you can even get water and basement sensors that alert your security company if there is a dangerous gas leak in your house or a pipe burst. Some of the best systems also feature "smart" sensors that can tell the difference between your kids, pets, and even adults to help prevent false alarms. Magnetic contacts: Your windows and doors will be fitted with magnetic contacts that will sound off the alarm in the event the connection is disrupted. Communication panels: In addition to system control, direct communication panels also feature a panic button that allows you to communicate to the security company in case of an emergency. Security stickers: Ask the security company to put signs that indicate the presence of a security system on your windows, lawns, and gate. Criminals are afraid of approaching homes that have a monitored security system. Battery and phone backup: When your power lines are tampered with, the battery and phone backup automatically activates and send a signal to the security company. Key fob triggers: Many homes today are automated. Modern alarm system installations provide key fob controls that can trigger or deactivate your alarm system with a single touch of the button. Contracts: Contracts with security companies do vary considerably. While some contracts require a specific length of time before you can opt out, others are more forgiving. Owning your system outright is an important consideration to make, so it is prudent to shop around and see which companies offer the most flexible services with the least amount of hassle. Installing your own automated DIY home security is one of those things best left to professionals. It's best to rest easy knowing that nothing was left to chance and you and your loved ones are protected. Compare several quotes from alarm system installation contractors in your locale, and you will receive the most competitive price available. Outbuildings like garden sheds and storage sheds are prime targets for burglars. Detached garages are full of valuables. Visibility issues from tall shrubs, for example, make a home an easy and inviting target. A professional from the security company you are interested in will come to your home and scrutinize all your property and make recommendations for the alarm system installation that is best suited to your needs. You will be given an option between wireless and hard wired. Since both are reliable, keep in mind that a wireless which will lower your overall cost to install an alarm system. A security firm will bill you depending on the security features you choose for your alarm system installation. Prices will vary depending on the extent of your installation alongside other factors such as regional pricing trends. If you compare various estimates you may find that the cost to install an alarm system will be around $700, although the averages are anywhere between $300 and $900 for the equipment and installation on a 1,000 sq ft home. However, for an average 2,200 sq ft house, most homeowners tend to spend anywhere between $1,200 - $1,600. Most alarms also come with a three-month warranty. If the system fails after 90 days, you are responsible for fixing it. If you want long-term coverage, you may choose to pay about $120 - $160 for an extended cover which should cover service calls and replacement parts. Also, keep in mind the annual monitoring fee of $500. To get a better idea of the cost to install an alarm system will be in your locale, Homes Ace is able to put you in touch with professionals in your region. Simply enter your zip code in the space provided on this page and professionals will reach out to you with a free quote. The cost to install your alarm system will depend on several factors. To get a more accurate idea of what you will be paying, get in touch with local professionals for your FREE estimate.